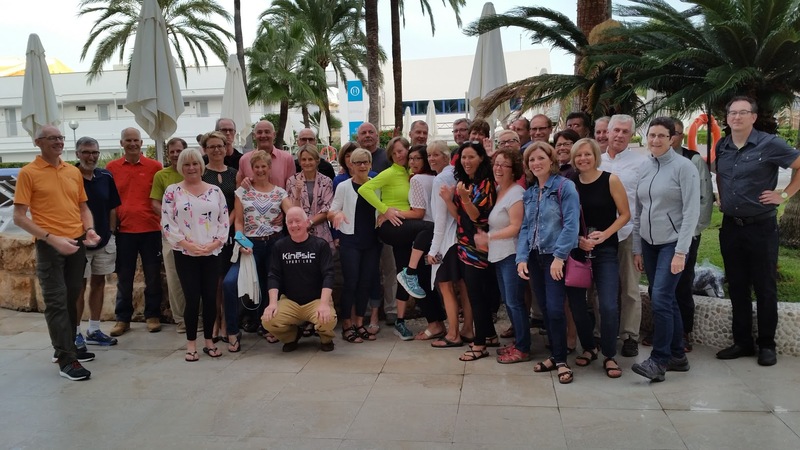 Our group trip to Mallorca far and away exceeded my expectations thanks to the amazing group of people who traveled with us to make this such a memorable adventure. Thanks for all the great photos, videos and for the amazing memories that we will live with us forever. The weather co-operated with temperatures in the 25 degree range each day and only 1 day of rain to aid much needed recovery from climbing the Mallorca mountains. In truth its nerve wracking for us as organizers to put a schedule of hikes and bikes together and then say trust us, you can do this when there is a rather large hill or mountain between our starting point and our destination. Hiking and biking in Lluc or Formentor is challenging but the views are worth the all the sweat and even a few tears along the way for the coffee at the end of the road at the Lighthouse or the Monastery. I’m pretty sure that on our first 2 days with rides to Lluc and Formentor that you thought our schedule might be a little ambitious but we knew that everyone would be capable and would enjoy the destination if not the hills necessarily as a prelude to our monster day to Sa Calobra. Now a little secret, for a few years we rode past the road to Sa Calobra in fear of the myth of the descent and the brutal but spectacular 10k climb back up to the summit and the ever present coffee shop. This is why I was so impressed with the 14 hardy souls who took on the almost 100k ride with 2000m of climbing and not a flat spot on the entire rode. As Daryl put it we had 2 ladies (Linda and Paula) with 1 original hip between them who rode effortlessly up the climb after a few anxious nights prior to the ride. 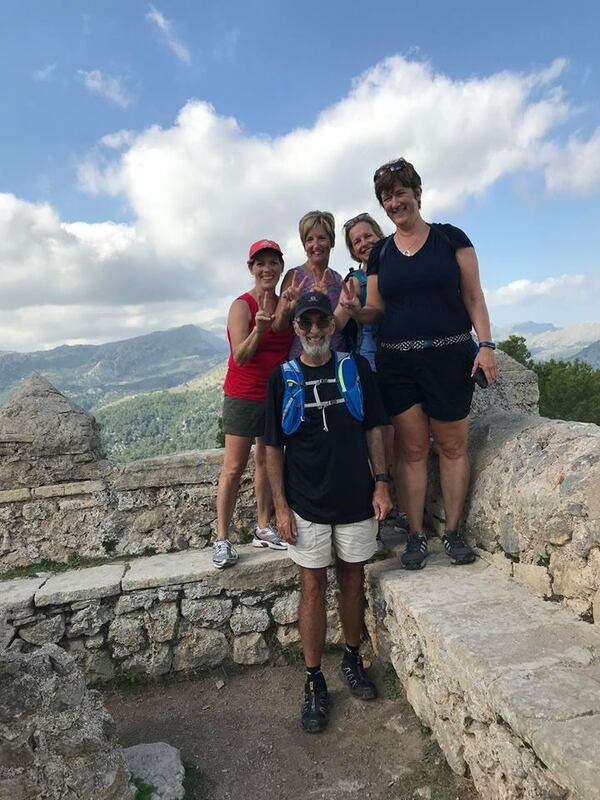 Our hikers had a varied and challenging ranges of walks and hikes around Alcudia, Lluc, Formentor, Pollensa, Cala Sa Vincenc amongst others with major climbs, spectacular scenery, scenic views and a great group of hikers who took on Daryl’s challenges each day. There are too many highlights to mention but we enjoyed our nightly walk along the promenade in Puerto Pollensa to reflect on what we had done that day and to look forward to the next adventure. Mallorca is one of Europe’s classic cycling destinations and we have been fortunate enough to visit this Spanish Island over 12 times through a combination of cycling club trips and Triathlon Training Camps we organized while living and working in England. Fully Escorted by Fundy Sports & Tourism. 10 nights accommodation based on 2 people sharing an Apartment. Half Board Accommodation – Breakfast & Evening Meal. Return Airport Transfers for people and bikes. Access to 25 meter pool (local charge). Daily Ride & Hike options from our hotel. Many Hikes & Bike Rides will be escorted. Limited support vehicles will be provided. Here is the Hotel description for the resort website. Mallorca sports hotel in Puerto Pollensa is ideal for athletes, parents, and children to enjoy the greatest sun and beach holidays or training camps. The Hotel & Apartments Villaconcha, our Mallorca triathlon hotel, has 4 swimming pools (one 25m heated pool with six lanes) and one children’s water park for families. After a lovely family day and a day of cycling, gym, swimming or running in Majorca, our guests can enjoy a spa, Jacuzzi, sauna, steam room, pool with temperature contrasting water and in which a team of professionals will be more than happy to assist you in all you may need. We are pleased to inform you that our new gym will be free of charge for our guests. The spa and the gym have a maximum occupancy of 15 people each. Our hotel offers a fabulous breakfast and dinner buffet with fresh vegetables, fish and meat and as well pasta, salads and lovely deserts. During the day our guests can enjoy various meals at our snack bar.